Benjamin Banneker, “Benjamin Banneker,” Histories of the National Mall, accessed April 23, 2019, http://mallhistory.org/items/show/77. Banneker was a free African American surveyor, mathematician, and almanac author from Maryland. In 1791, he assisted Andrew Ellicott with a survey of the boundaries of the District of Columbia. Among his duties on the survey, Banneker operated the astronomical equipment which helped the surveyors determine their exact location. Maryland Historical Society. View original. Benjamin Banneker was a free black resident of Maryland. His father was a freed slave and his mother had been born free. He lived most of his life in a cabin his father built on the farm which he eventually inherited from his parents. He learned to read and write from his mother and grandmother, and may have attended a local one-room schoolhouse run by Quakers in the winter. Banneker also studied on his own, making a functioning clock out of wood when he was in his early twenties. By 1780, Banneker lived alone on the farm: his parents had died and all three of his sisters had married and moved away. In 1771, George Ellicott, wealthy white man with an interest in the sciences, moved to the area. Ellicott shared his interest in astronomy with his neighbors, including Banneker. Because Banneker was so interested, Ellicott lent him a telescope and some books. Banneker taught himself how to make the calculations necessary to create an almanac. Banneker’s first almanac was published in Baltimore in 1792. He published five more almanacs, one for each year until 1797. These were sold in Great Britain as well as the United States. His publications and scientific achievements were touted by anti-slavery activists as proof of the injustice of racial slavery. Banneker himself wrote to Thomas Jefferson, at the time Secretary of State, to argue for national abolition of slavery. During this period, Banneker worked as a surveyor, assisting Andrew Ellicott, George Ellicott's cousin, with the first survey of the what would become the District of Columbia in 1791. 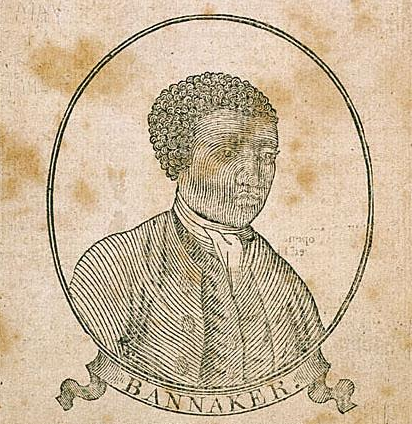 Banneker died in his sleep a month short of his seventy-fifth birthday. Sadly, a fire in his house shortly after his death destroyed most of his papers. Although he was a talented mathematician and scientist, his opportunity for advancement was extremely limited because of racial prejudice.